Most — but not all — Android phones come with a micro SD or SD card slot to expand the memory or just to allow you to put your own music, photos, and videos on the phone. SD cards are nice because you can make it accessible on your phone or you can pop it out and work with it on your PC. This step-by-step How-To shows you how to access your SD card through your Android device on any Windows computer. 1. Connect the Android device to your computer via a USB connector cable. The message, ‘A USB connected’ and a USB icon should appear on the Android phone. 2. On your computer click the notification icon noting the USB connection on your computer. Click on the ‘USB connected’ bar. 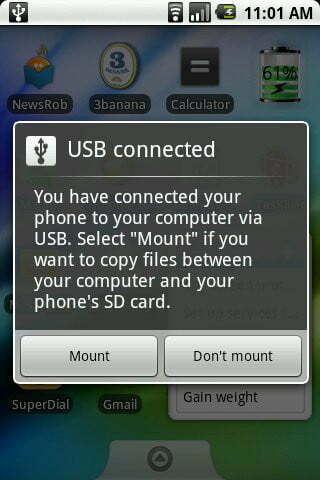 Select ‘Mount’ if you want to copy files between your SD card and your computer. Click the ‘Mount’ button. Note: Some Android devices come with an auto-mount feature. This makes the above steps unnecessary. There are also some auto-mount apps available. If you don’t want to go through the above process you can always try that. 1. You can now go into ‘My Computer’ where the SD card should show up as a ‘Removable Disk’. Generally, on a basic system with one hard drive and one CD/DVD drive the card will show up on the E:/ drive. If you’ve changed your hard drive or added drives you’ll need to do a little more searching but it shouldn’t be too hard to find. 2. Once you’ve found it double-click the drive and you’ll be in it. 3. Now that you’re inside the SD drive you can add and delete files by dragging and dropping. For deleting you can highlight the file and hit ‘Delete’. 1. Again, locate the drive in Windows Explorer. 2. Right-click the drive and then click ‘Eject’. 3. On the Android device access the notifications bar and click ‘Turn off USB Storage’. An alert will pop up saying ‘Make sure you have unconnected from USB host’. This should already done from Step 2. Click ‘Turn Off’ in order to complete the ejection. Now, you can unplug your Android device.